Few countries can vie with India in the wealth of imagery and symbolism built around the lamp. Our ancestors associated the lamp with almost all important events and activities of man’s transitory existence on earth. The birth of a child was greeted with a lamp and it was with it, again, that warriors were given a send-off and triumphant armies returning from the battle-field were welcomed home. 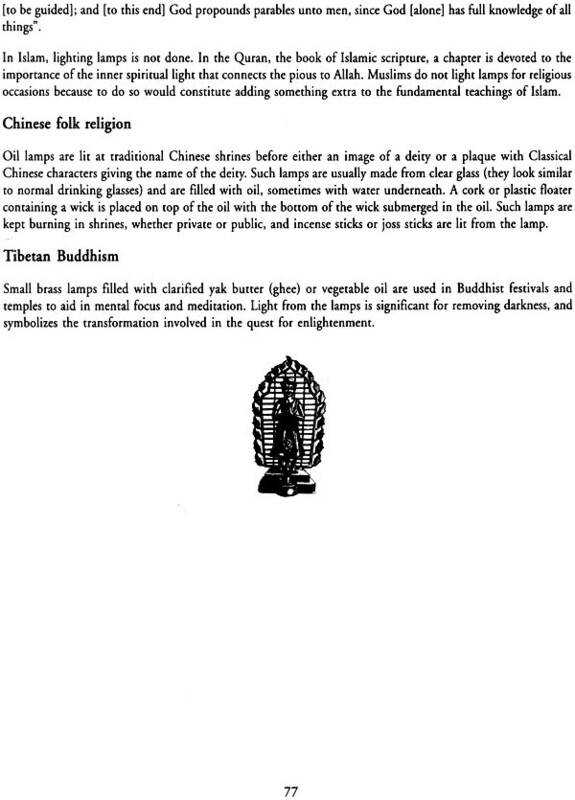 In temples and other places of worship the lamp had a still more prominent role. Being the medium through which a glimpse of the deity could be had, the lamp acquired an importance commensurate with the faith of the devotee. Consequently it attracted a good deal of attention at the hands of artists and craftsmen. It was, indeed, a happy thought on the part of Dr. D.G. 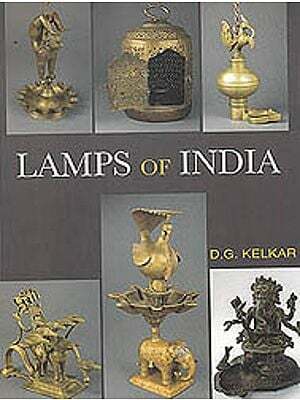 Kelkar to have laboured for collecting the various types of lamps used in India for a variety of purposes. 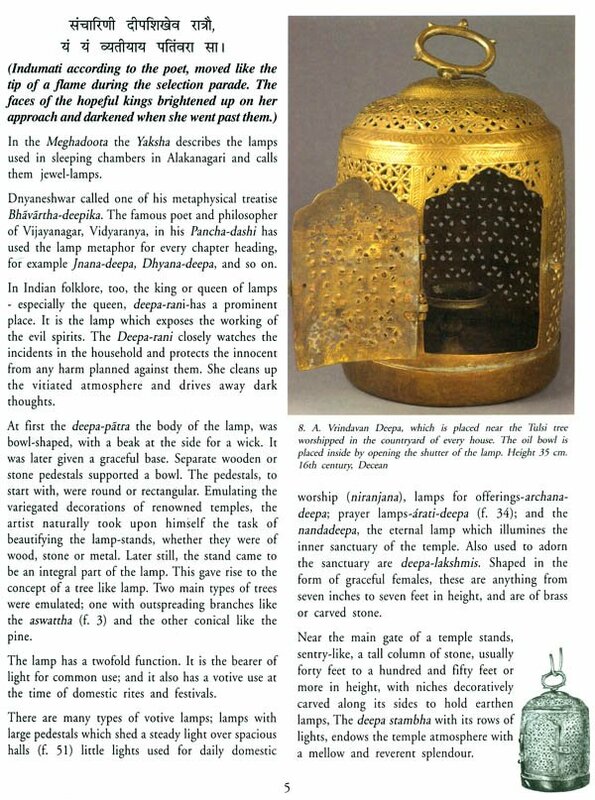 This collection, which I am glad the Publications Division of the Government of India is bringing out in the form of an illustrated book, furnishes an insight into the history of lamps from ancient to modern times. The wealth of information it gives and the subsidiary light it throws on popular beliefs and tastes is a tribute to Dr. Kelkar’s scholarship and industry. I have no doubt; the book will be a welcome addition to our literature on art and antiquities. The book Lamps of India first published in the year 1961 is being reprinted after a gap of 50 yrs. The need for a revised reprint was felt, as technological advancements have brought to our doors new information adding to our knowledge on the subject. The first edition of the book was a unique experience .While providing an insight into the Kelkar Museum, the book at no place seemed like a catalogue. It goes to the credit of Dr. D.G. Kelkar, who spun a beautiful text which kept the readers in-thrall. In his acknowledgement in the First Edition Dr Kelkar himself had pointed out that the book is not exhaustive. He also said that “It does not pretend to be more than a preliminary survey and I shall be happy if it serves as an incentive to further work in the field”. In the current edition we have tried to further enrich and enhance the scope of the book by including new material from various sources in the Appendices. The main attraction of this book was the illustrations of lamps which took us on a journey to the Kelkar Museum,Pune. 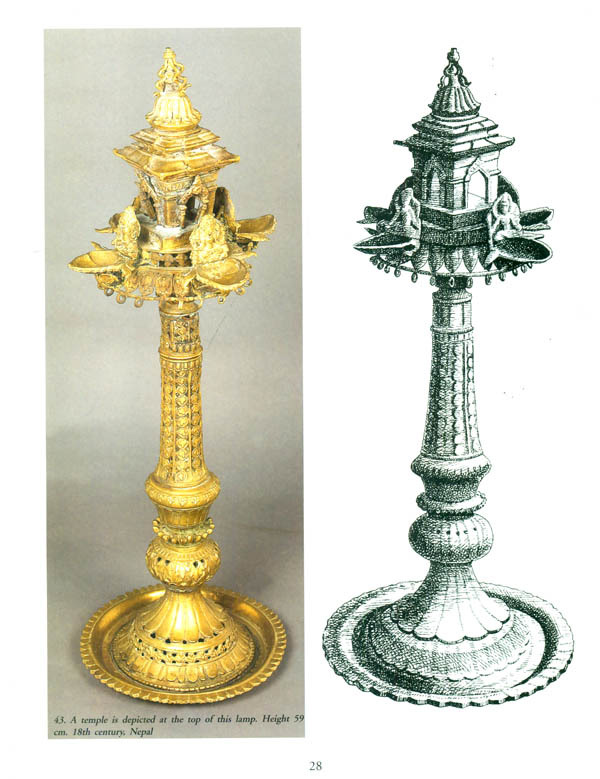 In 1961 when the book was first published Dr. Kelkar engaged Shri Sudhakar Khasgiwale for drawing the illustrations of the lamps which were the property of the museum . In our interactions with Dr. Sudhanva Ranade, Director, Kelkar Museum we came to know that the Museum was now in possession of high resolution photographs of these lamps, which they were ready to share with us. 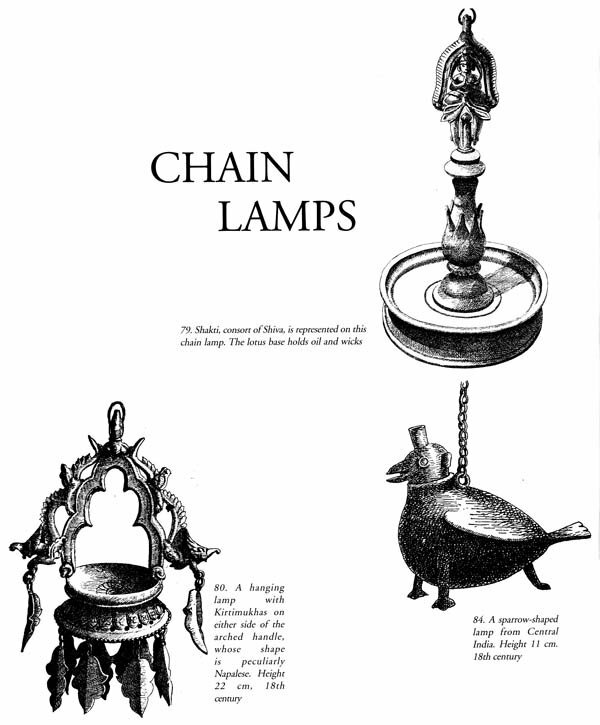 As we thought of publishing the colored photographs in this edition we also felt the need to incorporate the illustrations which had first provided us an insight into the world of lamps. This inclusion would be our tribute to the efforts put in by Dr. Kelkar and others. As a result we have retained all the earlier illustrations along with the photographs at appropriate places. We hope our esteemed readers would appreciate these changes and enjoy the book. Many millennia before recorded history-in the Eolithic, Paleolithic and the Neolithic eras-Man, like the other species, lived in cave and forest. He wandered about hunting and, when no game was killed, he ate such wild fruits and roots as were available to satisfy his hunger. He seldom could venture out after sunset. Darkness was to him a demon, and the Sun, the giver of light, a deity. With the passage of time he made another discovery, fire. Fire, he found, was light giving and life- sustaining. Man, therefore, saw fire as a deity, as Agni. The Rigveda gives the greatest importance to Agni. He is next only to Indra, his twin brother. The terrestrial flame, the serial flash and the celestial globe are the three forms of Agni. Born of aranees, i.e., igniting sticks, this god banishes darkness, frightens the demons and invokes the light. He is the supreme counselor, ancient but eternally young. The Rigveda describes Agni as the only master of the house and village and of sacrifice. He has flaming teeth; ghee and wood are his food. He is omniscient (jätavedasa); a poet; an immortal mediator (düta) between man and the gods. He conveys to them the yajna offerings and he upholds domestic life. Vedic literature is full of reverent prayers to Agni. We similarly find a number of hymns devoted to the Sun-God, Agni’s celestial form. The Vedas credit Bhrigu with the discovery of Agni around whom was built the sacrificial altar. The flaming sacrificial altar in the asliramas of the rishis was the focus of faith during the Vedic times. It has witnessed great philosophic seminars which produced the Brahmanas, the Upanishads and the Sanhitas. The cultural tradition of ancient India has thus its genesis in the spark of the yajna-vedi. This spark later assumed the form of a lamp. Among the light of fire, the light of the sun, the light of the moon, this lamp is the best of lights. With the deepa, the lamp, begins a new chapter in civilization, that which may be called the Deepa-yuga. As the symbol of Surya and Agni, the lamp has always been deemed auspicious. It was dutifully and religiously offered to Him who bestowed it upon mankind. The lamp was indispensable for prayer. It was a sacred token of devotion, supplication and benediction. The gods were believed to dwell by the light of the holy lamp. Its very existence helped man to shed the fear of the dark. To man, light was knowledge. The lamp was sacred; and once its august function was gratefully accepted by man, it was but natural that he should try to adorn it with beauty and grace, that he should make sundara what was siva. The body of the lamp, to begin with, was of stone or shell. Later came the innovation of terracotta lamps and then metal lamps. The Ramayana and the Maliabliarata, our two great epics, make extensive reference to lamps of gold and of precious stones. 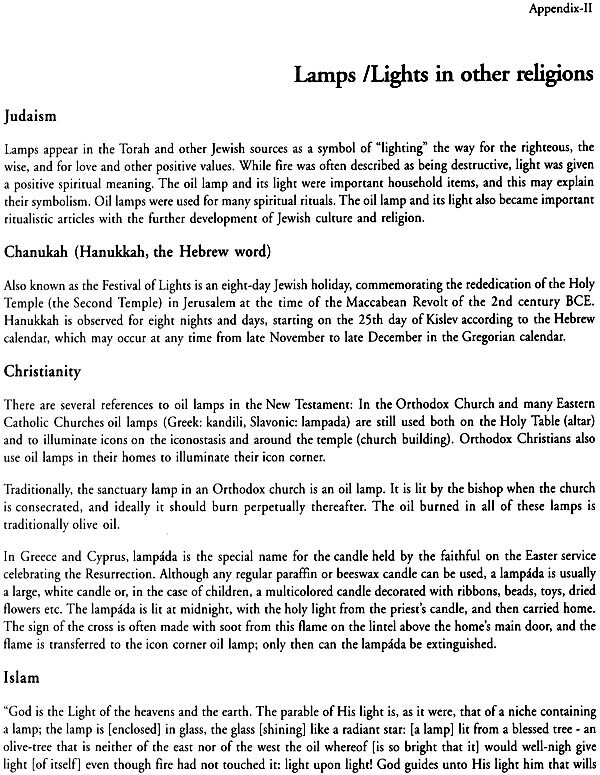 Because of its uncontested place lamp should have found mention in the ancient scriptures and secular writing. Reference to the Vedic and post-Vedic literature has already been made. Valmiki, in his description of Lanka in the Sundara-Kända of the Ramayana, has referred to the ratna-deepa. Vyasa, in his description of war by the night in the Drona-Parva of the Mahabharata, gives a thrilling account of maneuvers by lamplight. After describing the lamps among the elephant columns and the cavalry in minute detail, he remarks: “Yakslias, Kinnaras, Gandharvas, all of the Heavenly kingdom and the gods themselves, had congregated to witness the unprecedented battle. They had, in their turn, brought with them rows of lights. These ratna malas—strings of diamond lights—added their light to the bright lights of the battlefield, and those who saw this unique sight, continues Vyasa, were the most fortunate on earth”. The description of how Mayasura fooled the Kauravasa with hidden light in the palade which he built for Pandavas is another luminous passage in the Mahabharata. Indian Philosophy calls the soui a self-lighted torch. The flame of the lamp is likened to the Supreme Self. Life is like a lamp and the endeavour of the enlightened should be to brighten up others’ lives. Ancient texts elaborate the nature of this function. To live for oneself, like a little lamp, is the rmasa dharma; to live for others, like the deepa-mala, is räjasa-dharma and to live one’s life in the contemplation of the Universal Power is sãttvikadliarma. Lord Krishna has expounded in the Bhagavad-Gita the nature of the perfect mind. Among the characteristics enumerated is that such a mind is steady like a flame unshaken by the wind. The ancient sutras find a symbolic parallel for every phase and every turn of man’s life in one type of lamp or another. That is how the lamp has become a symbol of Indian aspiration. 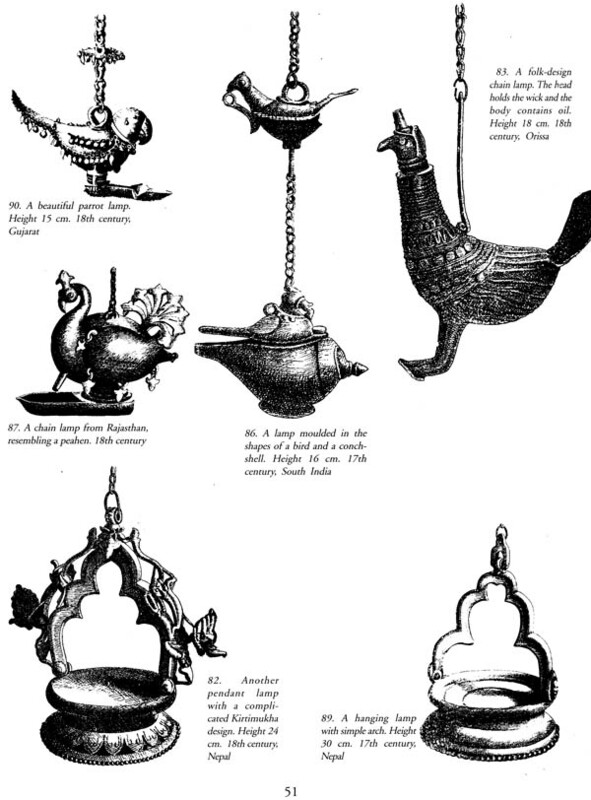 Mythology has made a powerful and continuous impact on the evolution of the lamp. 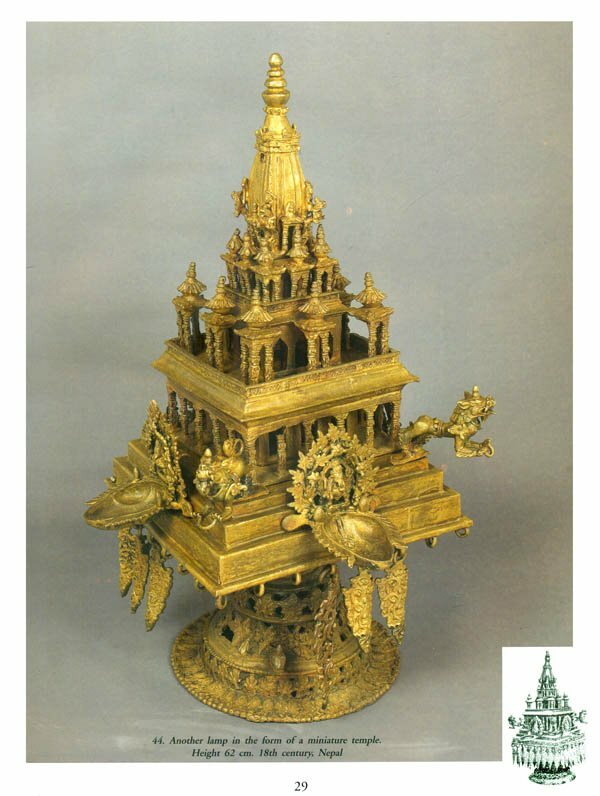 The ten incarnations of the God Vishnu have been an unfailing source of inspiration for the lamp-maker. Mythology has always fed the imagination of all our artists and craftsmen. Innumerable are the lamps which depict the incarnation-themes, such as Matsya. Kurma and Varsha. 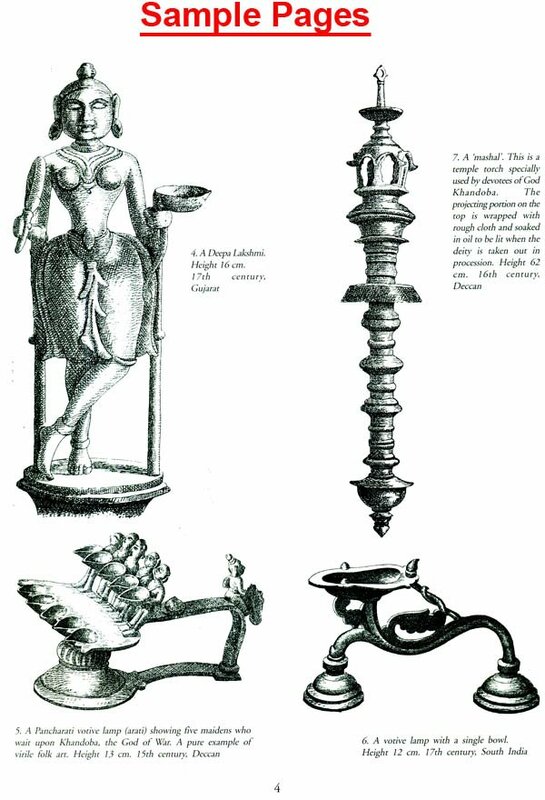 The lamps of Gokarna Mahabaleshwar also show us that divine emblems: like the Sankha, C’hakra, Gada and Padma were also frequently adapted.